1. Avoid contact with brush as much as possible. 2. Wear long sleeves with tight cuffs to protect your arms. 3. Wear light clothing when possible. Small “nymphs” can be almost impossible to see on dark clothing. 4. Check the scalp and warm places like between your toes for tick bites where it’s hard to find them. 5. Use insect repellants with 40% DEET for skin, and permethrin only on clothing. Fact: There are a number of tick species out there. 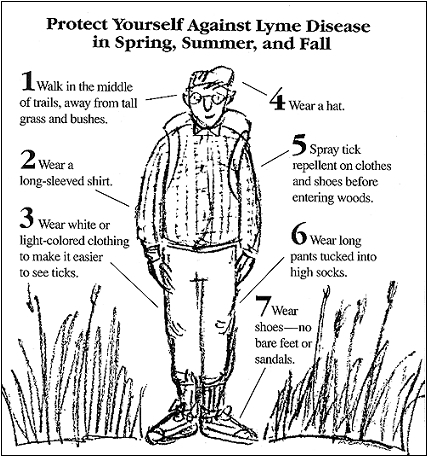 Only black-legged ticks (commonly called deer ticks) carry the Lyme disease agent. The American dog tick, Rocky Mountain wood tick and Brown dog tick do not carry the Lyme agent. Fact: Not all black-legged ticks carry the Lyme disease agent. In heavily endemic areas, one in five ticks may be infected, with numbers higher in specific areas. Fact: According to the American Lyme Disease Foundation and the CDC, only about 30-80% of those bitten by an infected tick will get the bullseye rash. If you do happen to be bitten by a tick, all is not lost. Lyme disease can be effectively treated if it is detected early. If you do happen to be bitten by a tick, all is not lost. Lyme disease can be effectively treated if it is detected early. However, going straight to the doctor is not necessarily the best idea. It takes about 4-8 weeks for your body to make antibodies to the bacteria, Borrelia burgdorferi the agent that most commonly causes Lyme disease in the U.S. If you test before 4 weeks you may very well test negative (false negative), but actually be positive for the Lyme infection. The best course is to wait about 4 weeks and then test to be sure the antibodies are present. You don’t need to make an appointment with the doctor, and pay a high price for Lyme disease testing anymore. You can now test yourself for Lyme disease quickly, easily and accurately. myLymeTest is the first ever, at-home collection kit for Lyme disease testing.